This year we accompanied Tamara’s folks to the Addo Elephant National Park. Frank and Karen had the good sense to stay in a chalet, but Tamara, Calab and I rolled the dice and opted for a camp site. And yes, it rained. By the time we packed up on Monday morning the tents were still thoroughly soaked, so with our wet gear in plastic bags, Tamara and I made the impromptu decision to spend the night camping at Wilderness (which happened to be sunny) in order to dry out. As usual we really enjoyed the opportunity to observe and photograph the Eastern Cape’s scenery and wildlife. 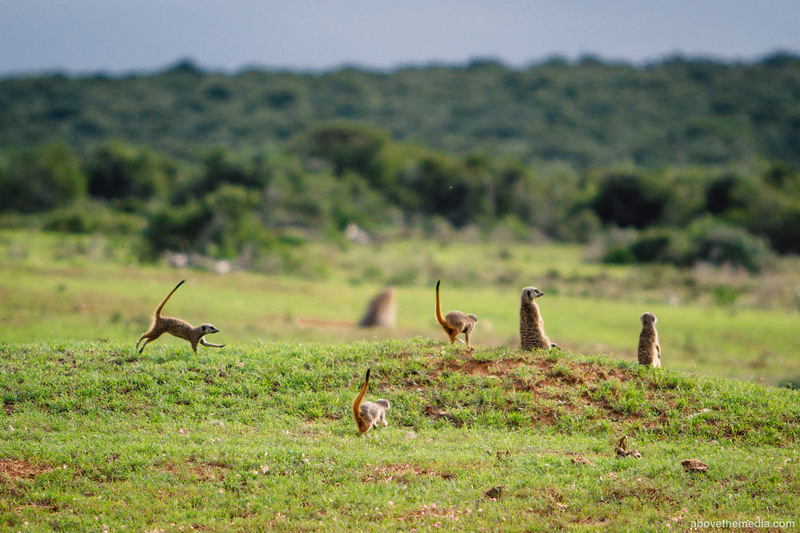 The weekend’s highlights included delicious potjiekos courtesy of Frank, being chased by elephants (twice), seeing the Easter Bunny on a gravel road and following two of Addo’s three “unofficial” cheetahs as they patrolled the borderline. I say unofficial because believe it or not, they broke into the reserve from a neighbouring game farm several months ago and decided to stay. We even caught a glimpse of the famous Addo lions just minutes before leaving the park. Photogenic people… awesome nature… I particularly love the pictures of the three puffed up starlings in and around the mud pool, the two buffalo sipping from the same tiny puddle and the Easter bunny in the road! Looks awsome… we off there this weekend and hopeing for some good sightings too… ps next time feel free to pop in and stay with us in George…. Thank you, we will certainly keep that in mind next time! Lovely!! My fav: the fox creature, the baby ellie and the lonely zebra having deep and meaningful thoughts about life..